We ended up harvesting 1.5 heads. The other heads either weren’t mature or were devoured by the local wildlife before I realized they had fallen. One of the heads seemed to be affected by mildew in the center, hence the 0.5. I still have two heads that are attached to living plants, so I may get another chance at harvesting more seeds. The process was pretty simple: either rub or pluck out the seeds and collect them in a bowl. Eva excelled at this task. 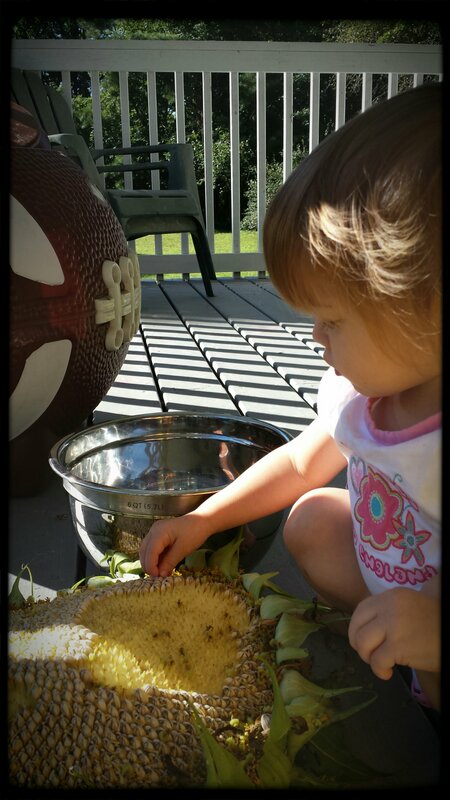 She liked running her hands through the seeds in the bowl. I’ll admit, it’s a pretty cool feeling. I performed a bit of quality control by picking out debris and damaged seeds. I’m now tasked with dividing up the seeds and roasting most of them. (I’ve received some requests for seeds since the plants were so impressive. The originals came from a $0.99 pack of seeds I bought at Walmart.) 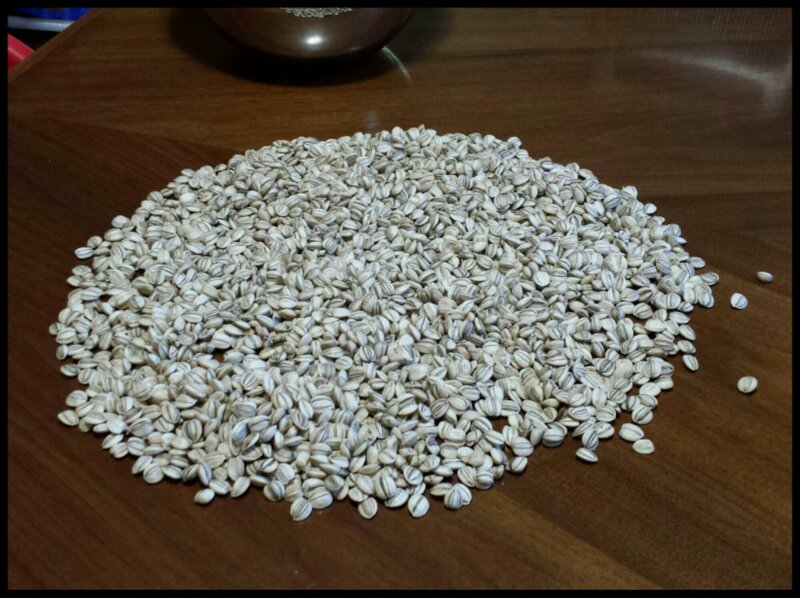 This will be my first time roasting sunflower seeds, so I have no idea if I will succeed. Wish me luck! Categories: Food, Gardening | Tags: gardening, harvest, sunflower seeds, sunflowers | Permalink. That is so cool! I’ve never harvested sunflower seeds before. I’m going to add it to my list of things to do. Thanks! I tried a practice batch a couple hours ago. 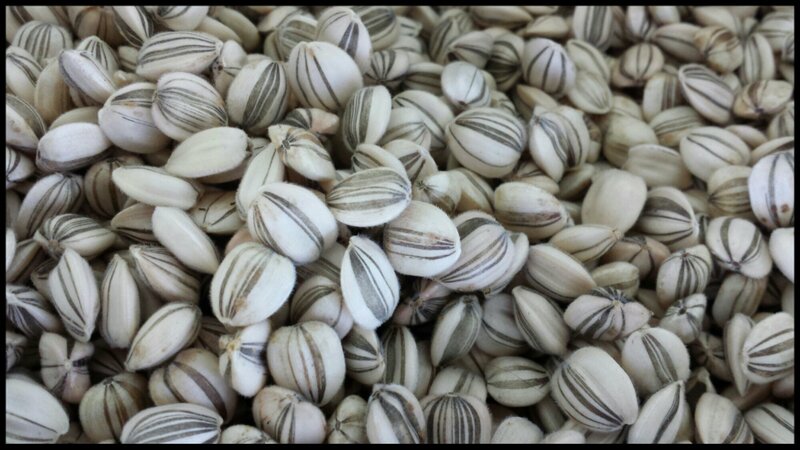 The roasting went well, but I was saddened to discover that many of the shells did not contain seeds. This might be a “breeding” problem, as I’m sure these things were interbred like crazy to produce ginormous flowers. I’m going to pick out the fattest seeds for planting next year, and hopefully I’ll have some luck! I bet that was really fun for her! In my limited experience I’ve discovered that no, sunflowers are not hard to grow. I literally put mine in the ground and watered them once. I haven’t done anything else to them. I know there are varieties that do well in pots, but I wouldn’t recommend putting mammoths in pots. Those grew about as tall as the house! I don’t think they require much room. They are skinny plants. You just have to make sure they get lots of sun. Ok, good! Thanks so much, I think I can do it next year! !